On a recent Summer trip to be in a dear friend’s wedding, I headed to the Pacific Northwest. Besides celebrating, we wanted to ensure this trip included some spoils of the region, in the form of their amazing wine and food. Upon a recommendation from a friend who lives in Portland, we had on our list, the small, funky and local Columbian Cafe in Astoria, Oregon. The small, seaside town was the location for the wedding and in June, when we were there, it was quiet and not at all overrun by tourists. 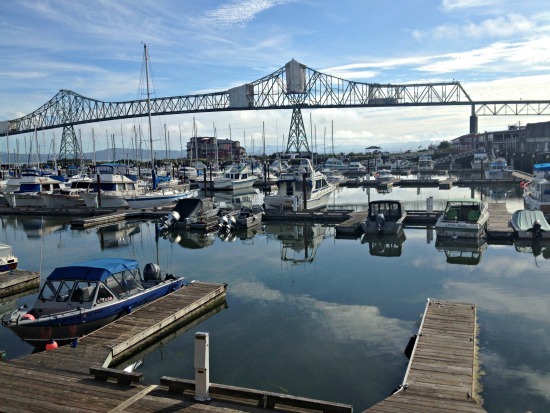 Astoria is the oldest American settlement west of the Rockies, which dates it back to 1805 as Lewis and Clark led their Expedition here. A former pelt trading post, a hundred years ago, Astoria was the second largest city in Oregon with a population of 8,975. Now, it’s just over 10,000. The size of the town I grew up in. What once was a very industrial town, has now begun to regenerate. There are brew pubs, interesting stores and eclectic coffee shops dotted throughout the town. Just two hours north of Portland, it’s often a haven for those who may want to get away to the coast, without being surrounded by tourists. Did you know that the tuna sandwich was popularized here in Astoria? Also, unrelated to food, Free Willy, The Goonies and Kindergarten Cop were all filmed in Astoria! The Columbian Cafe on 1114 Marine Drive in Astoria, is part of a theater and bar that all sit amongst each other. We visited The Voodoo room the night before a funky bar (cash only) with live music, antiques hanging around the ceiling and late night, hot pizza. The theater, also iconic to Astoria, plays movies, serves pizza and beer and has low price tickets ($4 general admission). 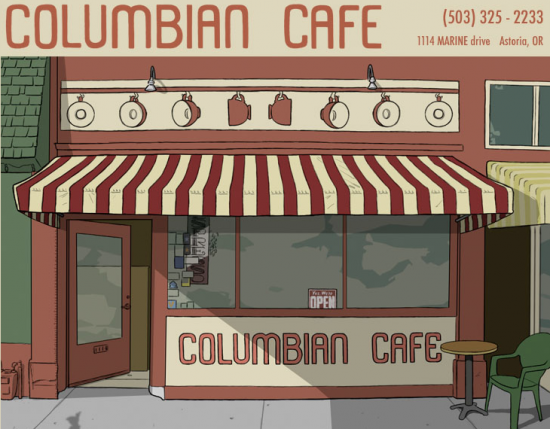 The Columbian Cafe is small and narrow. 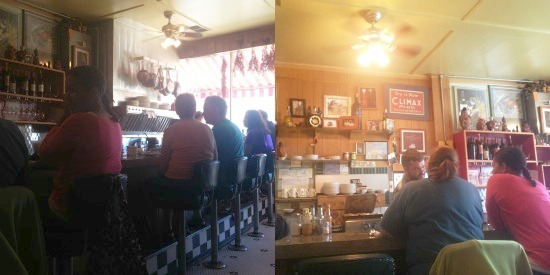 There are about four booths for seating and the rest is bar seating, overlooking the open kitchen on round diner-like stools. On the weekend, they don’t open until 9 AM to serve breakfast. 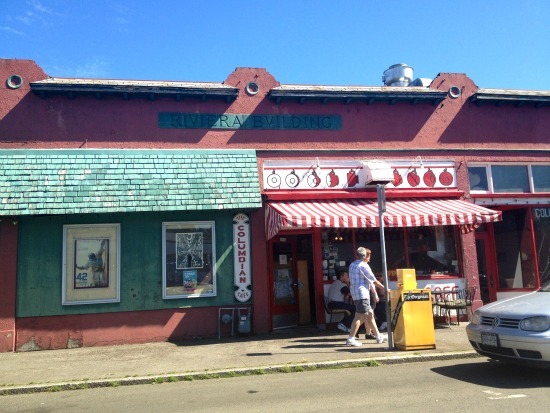 From the outside, it’s unassuming but just look for the red and white, candy striped awning. 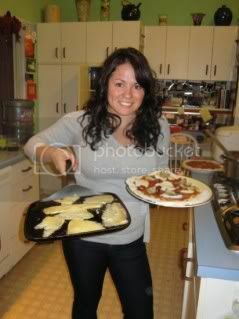 One of my favorite unique starters was the on the house homemade jellies and artisan toast, that they had just toasted on their griddle with butter. The jellies like jalapeno, garlic and cayenne are savory and incredibly addictive slathered onto the warm toast. Don’t eat too much of these (like I did), you still have your meal coming up. Chef/Owner Uriah Hulsey, has run Columbian Cafe for the last 30 years. Hailing from Louisiana, you can find a lot of creole influences in his food. Most of their vegetables that are on their menu, come from the Sunday market in Astoria as they love to work with farmers in ensuring their food is as fresh as possible. The quirks include artwork and family portraits on the old school wood paneling walls. Check out the family portraits alongside our booth. With the small space, the chefs cook on the hot grill behind the bar and chat with locals with friendly banter. A tip? Order the “Chef’s Mercy” – the chef creates a unique dish just for you, from scratch. It’s always from the daily catch or what is freshest that day and is sure to wow you. You can even share if you have any allergies and they can accommodate that mercy. They boast a variety of vegetarian options, but there’s always fresh seafood and plenty of food to delight anyone. After incredibly personal, yet relaxed (and not over the top) service, some of the best breakfast food I’ve had in a long time, we paid our bill (they only take cash, hit up an ATM before) and vowed to go back here. It’s that special of a place. If you’re ever in the area, don’t hesitate to reach breakfast, lunch or dinner here. You won’t be let down.